If you are a service provider to the hotels and motels industry, Blue Mail Media can help you give a big boost to your marketing campaigns. Our Hotels and Motels Industry Mailing List consists of contact data of the business executives and professionals associated with various hotels and motels worldwide. We collect all the contacts in this list by using some of the most credible sources like Business journals, Conferences, Exhibitions, and public filings. Our team of data experts updates and verifies the contacts in this list within every 3-4 months. Blue Mail Media takes you to your most significant business prospects with a customized marketing database. 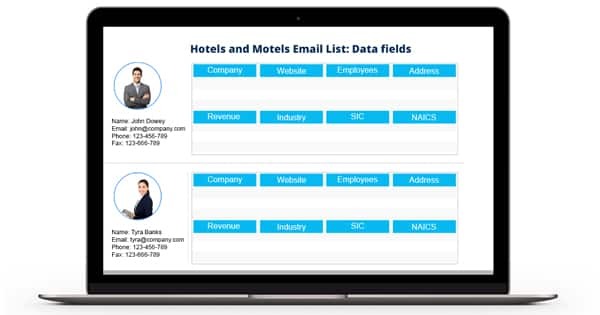 We provide pre-packaged and personalized Hotels and Motels Industry Email Database that will help you in running your multi-channel marketing campaigns successfully. This highly segmented list is created to give a holistic approach to your email marketing goals. You can also get it customized as per – the name of the hotel, number of employees, designation of the employee/employees, geographical locations, SIC/NAICS code and more.